Welcome to the semifinal edition of the Junto Summer Book Club! 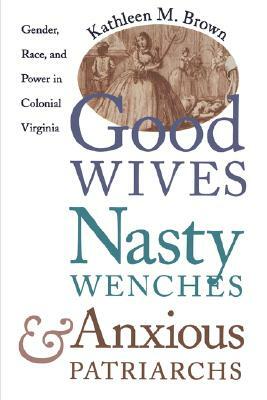 Before we head into the closing week, let’s pause at Chapters 8 and 9 of Kathleen Brown’s Good Wives, Nasty Wenches, and Anxious Patriarchs, to remember the ladies—and gentlemen—who invested in creating Virginian society. These Anglo-American gentry were made for the manor, not born of it; and that difference was seared into every part of their lives. Coping with the immediate effects of an Anglo-Indian gender frontier that “left a more ambiguous legacy for the English,” Brown’s colonial subjects struggle in these chapters to articulate power and class. The story here is one of reach, as Brown recounts the social process that eighteenth-century Virginian colonists tried to patent for long-term success and respectability in a less-than-new New World. By 1750, as Brown shows, Virginia and its colonial horizons of race, class, and gender had changed a great deal from Chapter 1’s initial view. With nearly 45,000 enslaved Africans brought to Virginia between 1700 and 1750, most planters owned slaves. And, thanks to a developing patriarchy, elite planters flourished. Poor managers like Byrd managed to thrive, seizing acreage and lifetime seats in the House of Burgesses, thereby minting new generations of patriarchy. Small planters, as Brown notes, were less fortunate in their efforts to navigate the system, or to muster any real attempt at opposition. Throughout the 1730s and 1740s, their sporadic revolts against corrupt tobacco inspectors, which included burning warehouses, were beaten back by a third generation of elite planters. Just as notions of race and class reified, Virginians’ ideas of gender roles formed around the realities of “smoothly engineered marriages,” many coldly plotted out on an “inheritance grid” of land and titles. A standout feature of Brown’s work, as we’ve seen from prior chapters, is her critical analysis of women’s agency in the colonial era. By leveraging what a woman thought going into marriage—say, in her commonplace book—versus the political reality of a woman’s marriage—say, after rejecting a colonial governor’s suit—Brown reintroduces us to the real and perceived responsibilities of colonial womanhood. Drawing on the “domestic choreographies” of planter wives, Brown explores whether the Virginia “gentry woman” was hidden in the home, or more powerful because of her authority over it. Somewhere in between (and likely a challenge for any researcher to retrace) lay a rough path for non-elite women to carve out in a Virginia, as Brown demonstrates, where elite white men had consolidated most of the available institutional power by mid-century. What do you think of Brown’s use of family history, and gossip, as sources to tell early American history? Building on the conversation related to gender frontiers, how useful do you find the concepts of “domestic choreographies” and the “female public”?